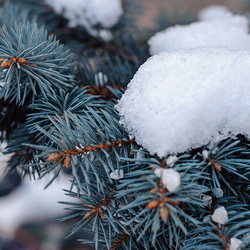 Popular Christmas Tree Varieties: Which One is Right for You? The Christmas season is upon us, and many of us are once again bringing the lovely tradition of the Christmas tree into our homes. If you prefer a "real" Christmas tree to an artificial one, there are many varieties available. Which one best suits your needs? Read on to find out! 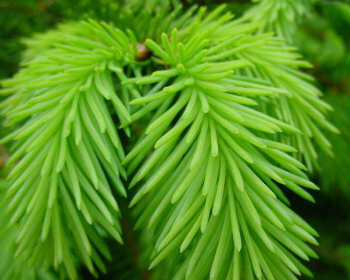 Different varieties of evergreen trees thrive in different regions of the United States. 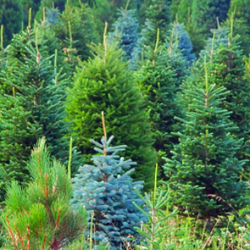 How do you know which one is the right Christmas tree for you? Here are comparison details on some of the more common ones, including varieties that grow in different climates and areas of the country. What are the must-haves and deal-breakers for you? Do you NEED that distinctive fragrance? Do you prefer soft needles that won't scratch up your arms as you string the lights? 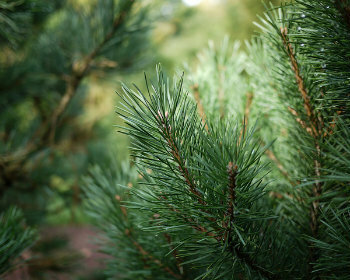 How long will your tree need to keep its needles? Will you be diplaying it in a pot, and planting it in your landscape once the holidays are over? Read on to find the tree that best suits your needs! 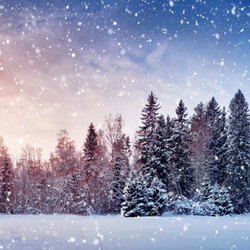 These are faster-growing trees, taking an average of 7 years to attain a 6-7 foot height, so generally are a little less expensive than some of the more slow-growing Christmas trees. They can be more labor-intensive for the grower, however, as the trunks are sometimes not straight, and they require more shearing to develop a desirable shape. Scots Pine (Pinus sylvestris) is one of the most popular Christmas trees grown. It was introduced to the United States from Europe. Needle Length & Color: Dark to medium green, with 1.5-3" stiff, firm needles in pairs. Fullness: Can be very dense and bushy, if it is sheared. Minimally sheared, has a more open appearance allowing for dangling ornaments to be displayed. Holds Needles: Very good, even when dry. Needle Length & Color: Dark green to blue-green, 1.5-3.5" needles in clusters of five. Fullness: ranges from very loose and open to quite dense, depending on shearing. 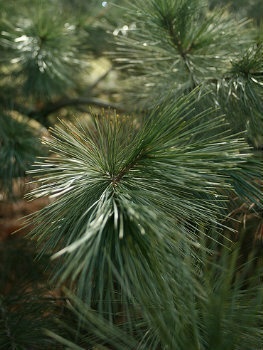 White Pine (Pinus strobus) provokes less allergic reactions than some of the more fragrant trees. This is a fast-growing variety. Needle Length & Color: Bright green color, soft pliable needles, 2-5" long, in clusters of five. Branch Strength: Slender and pliable, may bend under heavy ornaments or heavy decoration. Fullness: Soft and full, if sheared closely. While these are very attractive Christmas trees, they don't tend to hold their needles as well, making them a less popular variety for cut Christmas trees. They are less fragrant than most fir trees. They also tend to be some of the more expensive and difficult-to-find varieties, depending on the region. As a slower growing tree, they may be more expensive per foot than a tree that gives growers a faster turn-around. Colorado Blue Spruce (Picea pungens) is the state tree of Utah and Colorado. As a slow-growing variety, they can live 600-800 years in the wild. Needle Length & Color: Ranges from light to dark blue-green, 1" long, round, sharp needles attached singly, in a formation resembling a bottle brush. Very stiff needles with sharp tips. Fullness: Full, but can be pruned into a layered shape to allow more room for dangling ornaments. Holds Needles: average, may drop needles more quickly in a warm room, even with adequate water provided. Norway Spruce (Picea abies) is a very popular Christmas tree in Europe, where trees are traditonally not brought into the home until Christmas Eve. Needle Length & Color: Shiny dark-green needles, .5-.75" long, and attached singly. Fullness: Densely branched, nice conical shape. In the United States, it is more often used as landscaping tree than a Christmas tree. These are often planted to rows to provide windbreaks. Holds Needles: Fair to poor. Wait to cut in mid-December to last through the holidays. 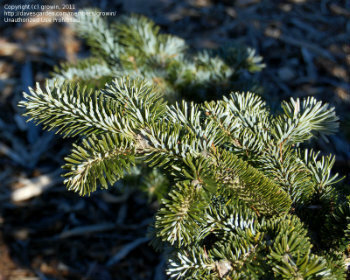 White Spruce (Picea glauca) is the state tree of South Dakota. Needle Length & Color: Short, stiff, silvery-blue needles, .5-.75" long, and attached singly. Fullness: Densely branched, often used as a landscaping tree. Fragrance: Traditional, less fragrant than most Christmas tree varieties. Some report an unpleasant odor when needles are crushed. Holds Needles: Fair. Cut in mid-December to last through the holidays. Fir trees grow more slowly than pines, requiring 10-12 years to attain the popular six to seven foot height most requested for indoor Christmas trees. Because they take longer to produce, they are more expensive. 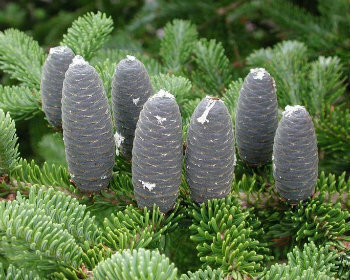 They require less pruning and shearing than pines, however, as they have a naturally straight and symmetrical shape. 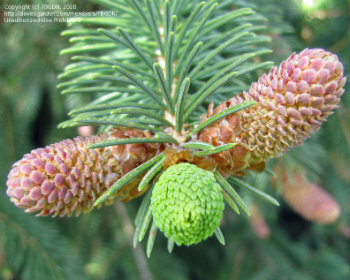 Balsam Fir (Abies balsamea) Very popular variety. Needle Length & Color: Dark green, flat needles .75-1.25" long, attached singly to the twigs. Branch Strength: Relatively stiff, can support heavy ornaments. 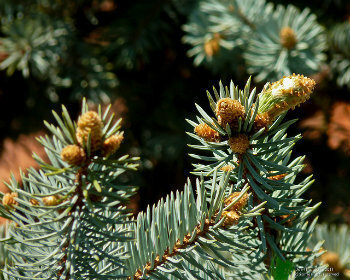 Canaan Fir, or West Virginia Balsam Fir (Abies balsamea var. phanerolepis) Pronounced ca-NANE, unlike the Biblical region of CAY-nan. These are rapidly increasing in popularity. This is due, in part, to the fact that they are nearly indistinguishable from the more expensive Fraser Fir, and can be grown in a wider range of climates. This is becoming one of the most popular varieties on my uncle and aunt's Christmas tree farm, with many repeat customers! 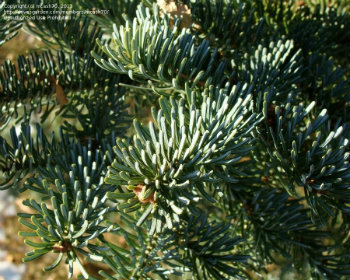 Needle Length & Color: Dark green-blue flat needles are silvery on the underside of the branches. Fullness: Full and layered appearance. 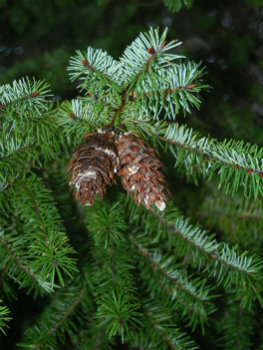 Douglas Fir (Pseudotsuga menziesii). 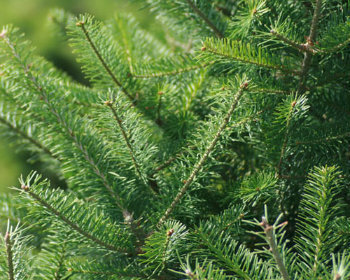 Nationally, one of the most popular Christmas tree species. Named after David Douglas, who studied the tree in the 1800's. This is a very long-lived tree as a live speciment, and a good candidate as a live tree to plant in your landscape, if it is appropriate to your growing zone. 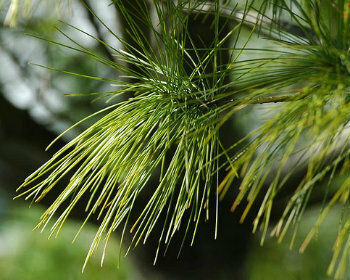 Needle Length & Color: Dark green to blue-green, with soft, 1-1/2" long flat needles, attached to branches singly. Branch Strength: Very soft and pliable, but densely branched, so good for smaller or lighter ornaments. Fullness: Very dense and full. Fraser Fir (Abies fraseri) Nationally, one of the most popular (and more expensive) Christmas trees. Named for a botanist, John Fraser, who studied the plant life of the southern Appalachian area in the late 1700's. Needle Length & Color: Flat, lustrous, dark green-blue, 1-1/4 in. needles, with a silvery sheen to the underside, are attached singly. Branch Strength: Good, can support most ornaments. Fullness: Very full and symmetrically branched, with a tiered pyramid appearance. Holds Needles: Excellent, but requires a lot of water. White Fir, or Concolor Fir (Abies concolor) My aunt, Carol Hill, reports that people return to their Christmas tree farm and say, "I don't remember what kind we got here last year, but we want it again! It smelled like citrus!" The fragrance is released when you pull off or bend the needles, and will fill your home with a lovely scent. Needle Length & Color: Silvery-blue round needles, 1.5-2.5" long, attached upright and individually to branches. Fullness: Layered, slightly less symmetrically shaped, may require moderate to severe shearing to maintain a desirable shape. Fragrance: Strong soapy, citrusy aroma. 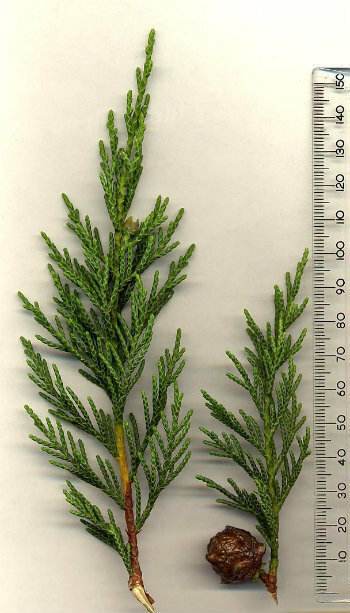 Leyland Cypress (Cupressocyparis leylandii), popular among those allergic to other Christmas tree varieties. This is one of the most popular varieties in the southeastern region of the United States. Needle Length & Color: Dark green to gray-green in color.